From the furthest walk to the closest, it’s May Day so I don’t want to drive too far for fear of getting stuck amongst the idiots with caravans. I regularly drive over Parbold Hill, it’s my normal route to the M6 for any journey northwards, and now and again we visit Cedar Farm, The Eagle & Child, and Golden Days garden centre which are all nearby. 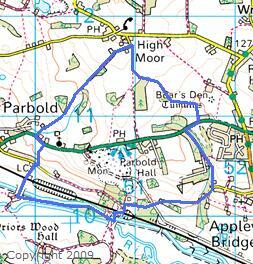 There aren’t many hills in the Southport area so the steep Parbold Hill is a bit of a local landmark. The walk starts off a layby on the eastern side of the hill, the layby is normally quiet but being a Bank holiday we only just squeeze in. 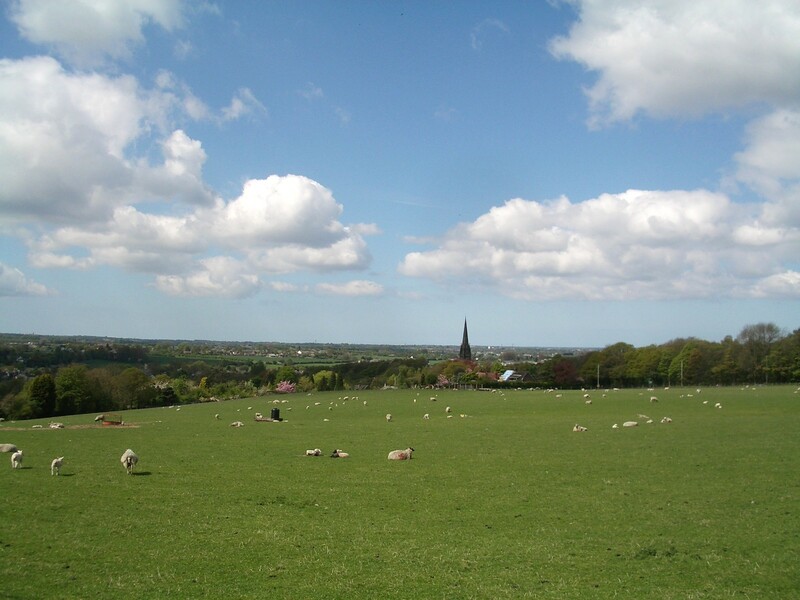 The walk starts by leaving the A5209 northwards and walking through fields, woodland, and then more fields to the small settlement of High Moor. We pass near the High Moor Restaurant which I wasn’t aware of but looks rather nice, it turns out that this is the sister establishment of the nearby Rigbye Arms which I haven’t visited, but have heard good reports. The route then turns 90 degrees towards the south west, heading down an arrow straight cart track, eventually turning into a field and still downward towards Christ Church steeple. The path disappears down into a wooded dell before springing back up onto the B5209. We head up the hill for a hundred yards before crossing and heading into a field on the south side of the road; the sun is out now, and their are lambs in the fields, all in all it is a beautiful day. We walk steeply downhill, emerging inot a country lane which then crosses the main Southport to Wigan railway line at a level crossing (always get a bit nervous at non-automatic crossings). 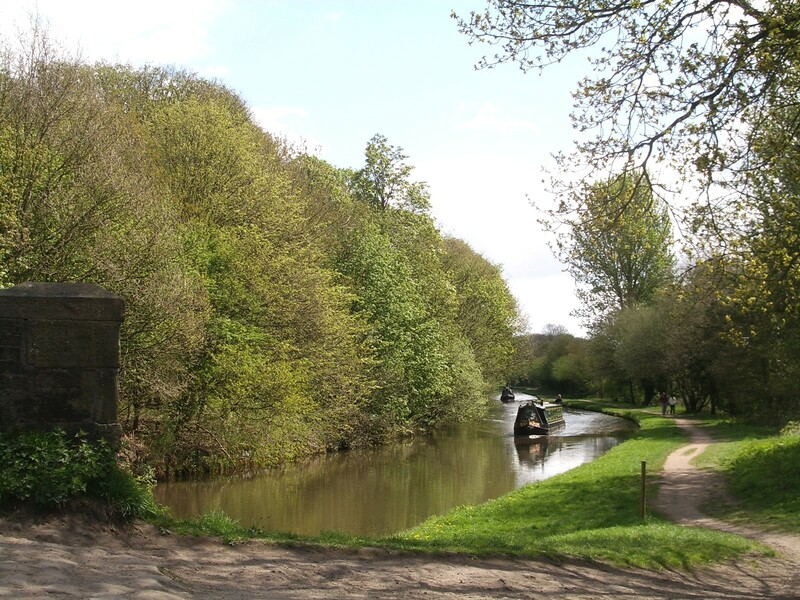 Shortly after we cross the Leeds & Liverpool canal and immediately join the souther tow-path heading east. On the far bank we see a satellite dish mounted on a tripod, and a rotary washing line complete with drying smalls in the middle of a field with nothing else around,it all seems a bit random unti a few moments later we realise that these probably belong to a narrowboat that would normally be berthed here! We stay on the canal until we cross the canal at Bridge #40 and cut along Wood Lane past some nice cottages and fields until we drop down into Fairy Glen. 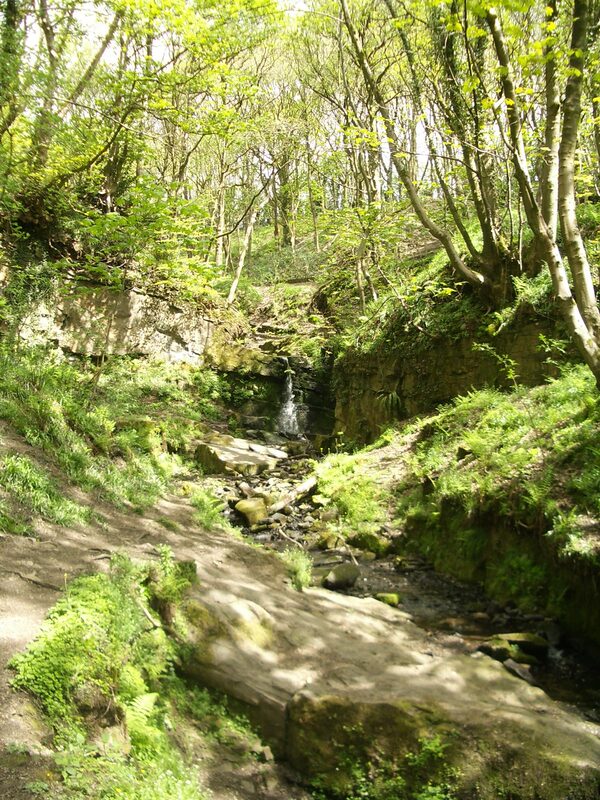 The glen is covered in wild garlic, the smell is pungent, pleasantly enough for now – but any more would be too much. As we walk up the glen it is strange to be in such a dank atmosphere after the dry, windswept walk so far; the glen is pretty enough but nothing to write home about. When we emerge from the glen back onto the A5209 it is with a sense of surprise; I’ve driven past here hundreds of times, and despite the entrance to the glen not being hidden – I’ve never noticed it before. It’s a short stroll to the car, and home in time for lunch.